Last Saturday night, we had a fundraiser concert and silent auction at my church. My card sales had been pretty slow since Christmas, so I pretty much cleaned out my bin of cards. I took almost all of the birthday, blank and thank you cards I had on hand, grouped them as 7 sets of 10 cards and put them into clear boxes with pretty ribbons around them and donated them to the silent auction. They all sold for decent prices and I was happy to start with a proverbial 'clean slate'. Or empty bin! Then one of the teachers at school asked me to make her 40 thank you cards. Then I made plans to meet up with a girlfriend this weekend. She asked me to bring my card bin because she's desperately low on birthday cards and needs to stock up (she often buys 30 at a time since we don't see each other very often). Then one of my long-term Christmas card clients emailed me to ask that I make her a 'box' of assorted cards for her personal use. Oh, the irony is not lost on me! But I'm not complaining! All this week, I've been busy looking back at my designs to see what I can reuse to whip up a bunch of cards quickly. But I also like to try something new. And it's amazing how just 'having to get it done' gets the creative juices flowing! Love that productive feeling! 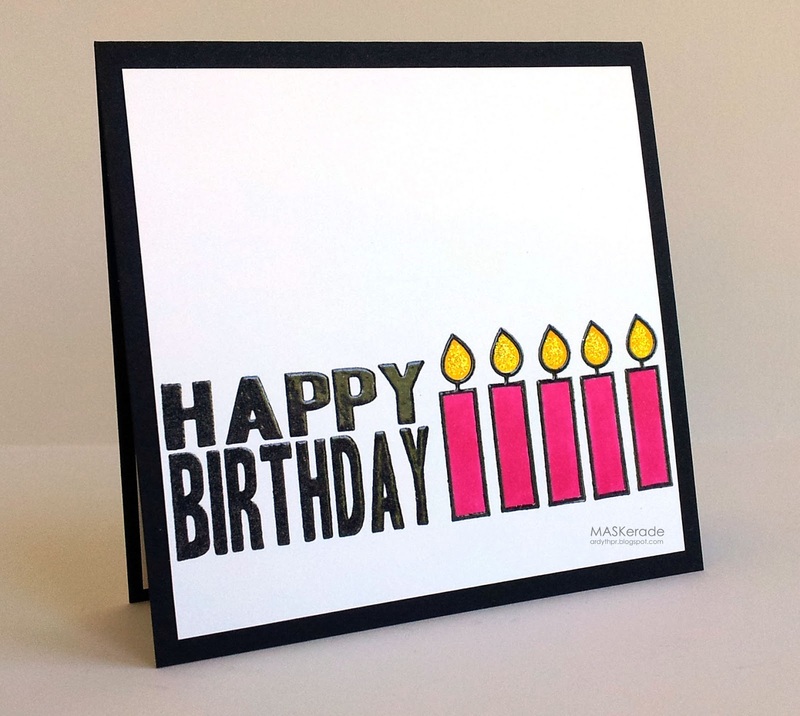 This is the first new design I was really pleased with - a simple graphic card using a Michael's sentiment and a Paper Smooches (Sugar Rush) candle. Bold, high contrast colours, simple shapes, a little sparkle and done! Ardyth-Isn't that always the way LOL you dont use something in forever and the minute is gone you need it !! Sounds like generously giving away the contents of your card bin has come back tenfold :) you are going to be a busy bee making all those cards. Oh.My.Goodness. Ardyth! I would be like the proverbial chicken careering about in headless fashion, just at the thought of all those cards ... actually I'm surpressing those clucks right now! Love this story...I just donated a basket of cards for a silent auction and the next day my mum said, "I really need a set of cards." Zero birthday and thank you were in my stash! Not as many asking as you have, but I feel your pain! Love both of your fabulous birthday cards. Seems like the empty bin is working for you, though! What a great card...love all the glitter! Oh I just love your makeover card Ardyth and I would not be surprised for you to be in the top 20. Wow are you in demand--how great! 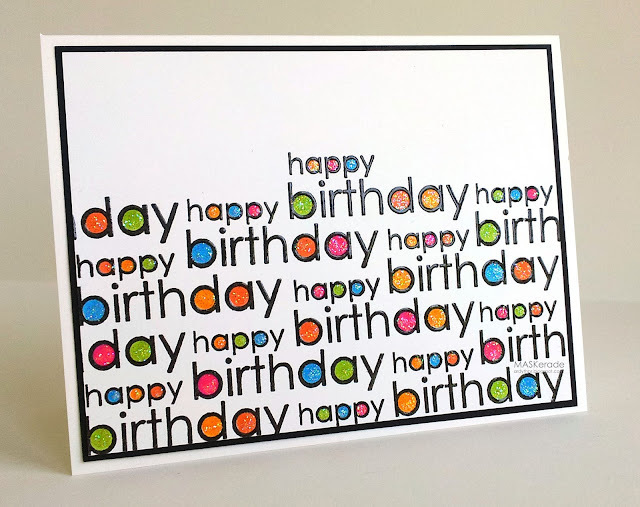 I can sure see why--always love your work & these BD cards are so striking--love them! Two fabulous birthday cards Ardyth! I love how you always add just the right mount of sparkle!! When it rains it pours -- I wish it would rain for me! How awesome to get that many orders!! Good for you. Love the "new" black embossed Bday -- looks so cheerful. Congrats on your business success! I am not surprised - I love your card, too! I am curious how it all started - if you are caught up with all your card orders would you mind blogging about it? I'm relatively new to following your blog but just wanted to tell you how much I enjoy it. I read it every day. And of course I'll been supporting you in the Gallery Idol event! Quick question about something in your post today - I've been thinking about selling my excess cards to coworkers and was intrigued by your friend you buys from you. What do you charge for your cards? I don't want to charge too much as my coworkers are my friends but I want to be fair to myself too. Thanks for the info if you have time to respond. And keep up the great work on the blog. I love it! Love both of these, bright bold and fun! !